Posted by Charmaine at 9:49 a.m. Yes, it WAS delicious! Devon's eyes were huge when he saw the cake and he grabbed the ball and several bananas and had them in his mouth even before we'd finished singing. They must have been yummy, because when he tried to blow out the candles he drooled on the cake! It was certainly a hit - thanks again. I'll send you some pics when I get them uploaded. January 19, 2008 at 9:03 p.m. Happy Birthday Pastry Blog! That is another amazing looking cake Charmaine and it sounds delicious too! Is that filling something mere mortals could attempt? Anyway, I've been watching Ace of Cakes on FoodTV down here and I think of you every time! January 31, 2008 at 4:46 p.m.
Hi Judy! Thanks! Of course you can make the filling. Ganache is just melted chocolate blended with hot cream (the proportion depends on what type of chocolate you want to use) and after it is set, whip it up with a mixer until it's light and spreadable. Caramelized bananas are just sliced, then added to a dry caramel with butter and cooked until tender. Don't know how to make a dry caramel? There is a great post on Dave Lebovitz's blog (Jan 29th)...just follow the link on my blog. January 31, 2008 at 7:42 p.m. Thanks for the directions Charmaine. I've made wet caramel before, but I'm getting ready to try a dry one. I've been reading David Lebovitz's blog for a couple of months now, and I'm about to attempt the caramelized chocolate crunch. He's coming to Texas to teach a class in Parisian desserts in April and I plan to go! February 2, 2008 at 8:23 p.m. 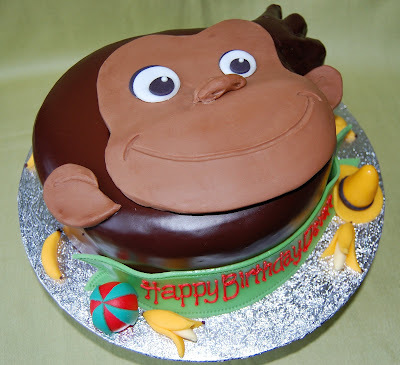 This cake is sooooo adorable and yummy looking with the ganache. I read that you can make the modeling paste. I just took a class on how to use fondant and would love other ideas that are more tasteful than standard fondant. Could you post a recipe for your modeling paste? April 11, 2008 at 5:30 p.m.
April 14, 2008 at 10:49 a.m.
What was your base under George's Cowlick?? I hope you don't mind sharing??! January 3, 2011 at 6:40 p.m.
Karin: It was still cake, carved as the cowlick. Good luck! January 4, 2011 at 9:17 a.m.